My life has been a series of one-night stands lately … but in a good way. When we are housebound, it’s really nice to have “Airstream friends” come by with their trailers and spend a night or two parked in front of the house. Having people come by and talk about where they’ve been, and where they are going is almost like traveling ourselves. There’s the inspiration and excitement and new ideas that come from minds that have been out exploring the world. All of that rubs off, like pollen from a bee’s legs, when they drop in for dinner. In the post-Modernism Week letdown, I was expecting that nothing interesting would happen except work, but even before Brett mounted his 737 to return to Tampa we got a call from Erica, who was one of the exhibitors at Modernism Week. 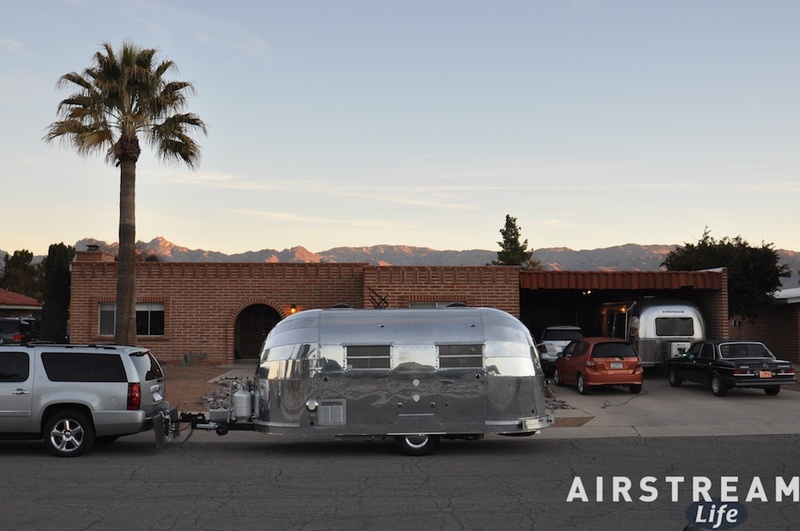 She was passing through Tucson her way home and so we immediately invited her to come courtesy-park for a night with her exceptionally cool 1948 Airstream Trail Wind. It’s not every day you see a 1948 Trail Wind. Very few were made; even fewer are road-worthy today. I have seen only two: one shell needing complete rebuilding, formerly owned by Brett; and Erica’s totally tricked-out and modernized geek showcase (I mean that in the best possible way, being sort of geeky myself). So I had to convince Erica to stay in front of the house, and in the morning I snuck out shortly after dawn and caught a few pictures of this rare trailer while she was still half-asleep inside it. That was cool, and I told Brett that I wished everyone from Modernism Week would come by and spend a night at the house. I didn’t really expect to see anyone else, as the group was quickly dispersing to all corners of the planet (Kristiana and Greg, for example, are now in Nepal). So I was very pleasantly surprised when John Long call me late yesterday from the road to ask if I was free for “a coffee” as he was passing through Tucson. John and I were up to well past midnight talking trailers and all other things, but when I awoke at 6 a.m., both he and the Bowlus were gone, slogging down I-10 in an attempt to make Austin TX by Wednesday. Yet another one-night stand, but I’m OK with it. Can’t wait for the next one to come by! If the TV doctor, Dr. Oz, can have a “truth tube”, then surely there must be a nerd-o-meter available to measure the man-in-the-maze’s geek quotient. A side by side measurment to the Richter scale, the MITM would register an 8.7, nothing short of a major force. Fortunately, there is no known geezermeter. You can tell I’m from New England when my first thought upon looking at the top picture was not. Wow look at that beautiful classic Airstream or Look at the breathtaking mountains in the background. Nope, my first thought was… sure glad I don’t have that roof :). It’s been a looong winter. Rich, I’ll bring the ’66 Globetrotter by, with the dimpled bellypan, the telltale plexiglass window and the savage butchery done in the bath by the previous owner who thought that copious amounts of resin would repair cracks. It will be a picturesque counterpart to the Trail Wind and the Bowlus. Hmmm…interested in your Newbie stuff. 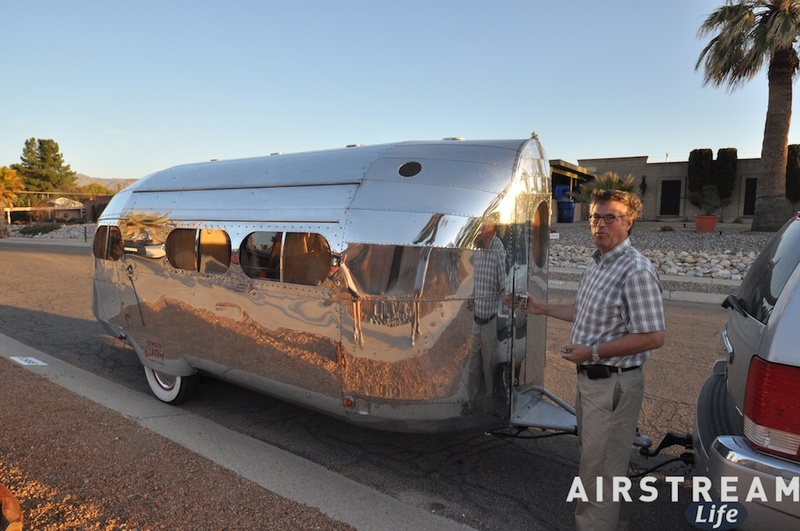 Just wondering about the possibility of doing a separate publication of the interesting old Airstream trailers like those above. A compendium of sorts. Wow, where in the world do people find these beautiful works of art?